When Samsung unveils its flagship smart phone Galaxy S5, how could it be possible that HTC just sits back? Here comes the good news that HTC also launches its well-developed HTC One M8 on April 11, 2014, which straightway causes a sensational effect among Android fans. This fire-new HTC One M8 is expanded its display to 5.0 inch with Full HD 1080p up to 441 PPI, even better than iPhone 5S. And it's powered with mighty Qualcomm Snapdragon™ 801, quad-core CPUs, alongside advanced Android™ with HTC Sense™ HTC BlinkFeed™ operating system. More incredibly, embedded rechargeable Li-polymer battery with capacity up to 2600 mAh, it can support you to have talk time up to 20 hours and 496 hours for standby. No room for doubt that it couldn't be better to watch videos on this fabulous Android phone. Convert MKV to HTC One M8 - Yes OR No? I have some .mkv files stored on my mac computer and plan to put them to my new-bought HTC One MKV for watching on the subway to kill the time. But it seems impossible to put mkv to htc one m8 directly. How should I do? Any suggestion, Thanks. Providing you encounter the same case, do you have a simple yet clever move? If no, I have one tip for sharing - change MKV codec format to HTC One M8 friendly format like MP4, AVI, WMV, 3GP and 3G2. In consequence, a reliable yet edge-cutting video processing software is of the essence. Here MacX Video Converter Pro is your cup of tea, which is capable to convert MKV to HTC One M8 compatible video format, e.g. 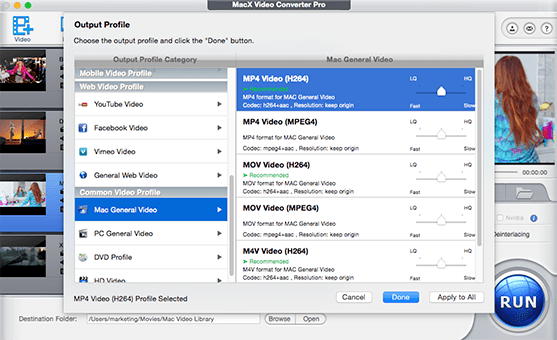 MKV to MP4, MKV to 3GP, AVI and more on Mac with purely 4 mouse clicks. Moreover, armed with High Quality Engine, multi-core CPU use and GPU HW acceleration tech, this big-league conversion program can ensure you to import MKV video to HTC One M8 with original high quality and 5X faster speed. 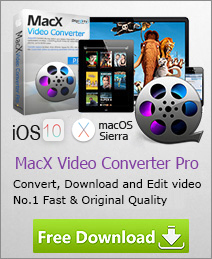 Step 1: Load MKV file after free downloading MKV video converter on your Mac. Click "Add File" button to load MKV file you want to convert to HTC One M8. This video pro can also support to transfer MKV files to HTC One M8 at batch. Step 2: Choose the Output Video Format. You can choose different formats for different files. Here we choose MP4 as output format from the format list. You can also choose to convert MKV to HTC One M8 supported format like AVI, 3GP, 3G2, WMV for playback or uploading. Tips: This stunning HTC program is also available for you to download and convert YouTube video on Mac; no matter the SD video or 720P/1080P/4K HD YouTube video, it can easily download and convert them just with an eyewink. Even downloading 2018 FIFA World Cup theme songs costs merely 30 seconds, unbelievable, right? Step 3: Select the Output Folder. Click the "Browse" button to choose the path where you want to save the output video in. Step 4: Start Converting on Mac. Press the "RUN" button and the converter will convert MKV to HTC One M8 in MP4 file format in a few minutes. Then you can enjoy video on your HTC One M8 for watching on the move. Note: Besides splittingly decoding MKV to HTC One M8 on Mac, this all-conquering Mac video transcoder also equips itself with screen recorder, slideshow maker and powerful video editor, whereupon you are allowed to record a tutorial for sharing on YouTube, share your photo slideshow with your friends, customize your video as you please.